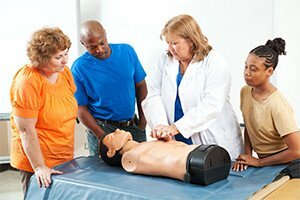 This course provides instruction in adult/child/infant CPR, adult/child AED, ambu bag and barrier device usage, and relief of foreign body airway obstruction. This course is intended for Healthcare Professionals requiring a credentialed course but is available to all who are interested in taking the course. All CPR instructors provided for this service are certified American Heart Association instructors and employees of INC.
Pre-registration and payment is required prior to the class. Call 716- 655-8776. Cost of the course will include textbook and two year AHA certification card.